Last year was full of dramatic upheavals and new beginnings. Root-bound, I was like one of my houseplants, dry and scraggly, leaning out in odd directions in a desperate reach towards sun and water. Drastic steps were required. So I took a hard look at my life. It takes energy to carry dead weight, so I trimmed off everything that wasn’t vital or nourishing. When I was done, I was just a cutting, rootless and small, taking a huge gamble on my own capacity for new growth. It was sketchy at best, but I was determined. Early last fall, with a new job and a rosier outlook, I was thinking about the oncoming cold weather, and how much a blooming geranium brightens up a winter window. And in a mad fit of hope, I cut a piece off of the one geranium that has survived in my kitchen, and stuck it in a small vase of water. Maybe, just maybe, it would grow roots, and I could plant it. Maybe it would bloom. Maybe I could put it in my office at work and have flowers in winter. Maybe it would flourish. Maybe (this was getting to be a lot of “maybes”) it would be a symbol of my own burgeoning hopes and aspirations, of new potential coming into fruition. Taking a scrap of plant matter with a dubious future and asking it to serve as a cheerful metaphor for my own personal development probably wasn’t a great idea. Seriously — if you want to turn plants into metaphors, you should probably at least use an actual, healthy, entire plant, not an uncertain cutting. But, well, that’s me. I have an affinity for the improbable. Then a miracle happened. A tiny little root appeared. And then another. Then more. My cutting grew a mass of pearly white-green roots. It grew a bud and new leaves, and it bloomed in a glorious globe of bright red blossoms. Success! All was well. I stopped worrying about it and just reveled in that joyous splash of color against a backdrop of winter greys and browns. I meant to plant it, but Thanksgiving had arrived, and it could wait. I was thankful for my little bloom. I would plant it when life settled down a bit. By Christmas the leaves started to die. One by one, they turned yellow, and then brown, shriveled, and fell off. By New Year’s Day my cutting was nothing more than a stick with roots in water. Sometimes timing is everything, and I’d dawdled. But the thing is, I am a crazy-hopeful person, even when hope is a little absurd. So I changed the water again and set it back on the windowsill, trying not to think about my failing metaphor. 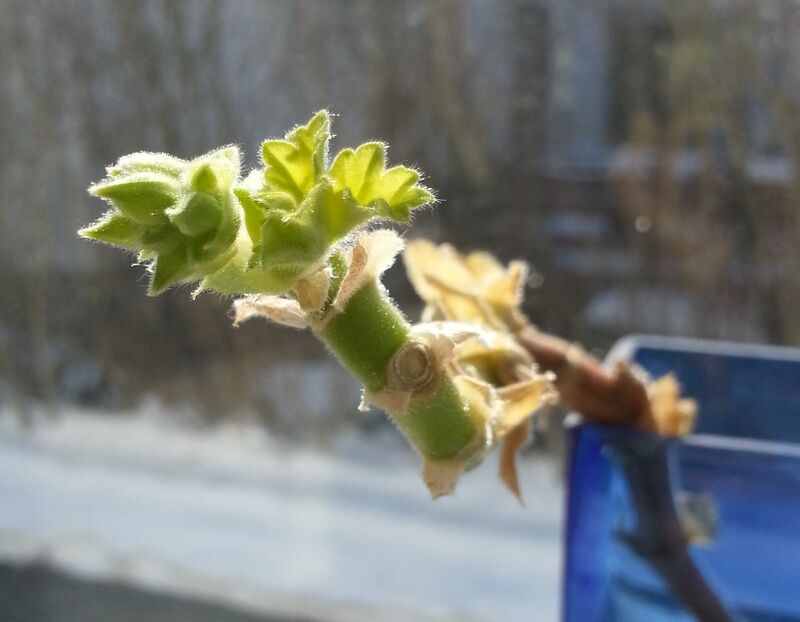 Geranium Bud, March 8th 2015. Somehow, just as February rolled over into March, a small cluster of buds and a teeny tiny baby leaf appeared! 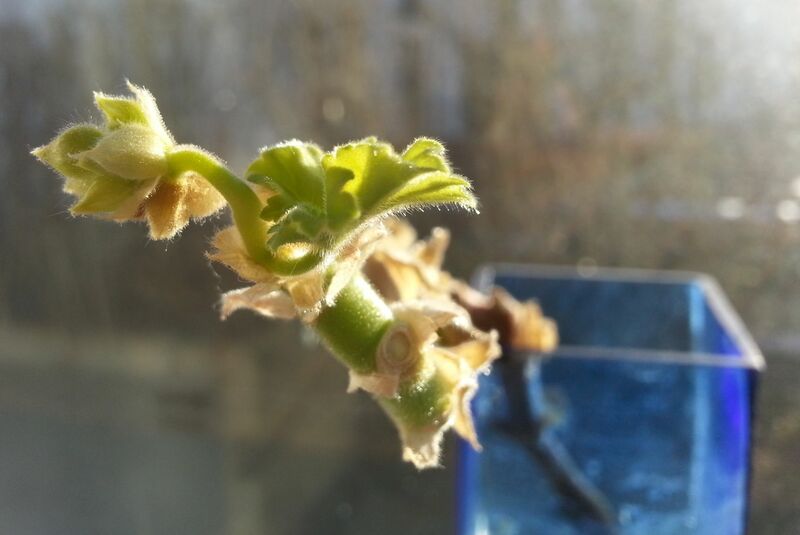 Three weeks later, it is officially spring, and the bud on my struggling geranium is ever so slightly bigger. Also browner, which leaves me a little uncertain as to whether or not this is actually progress. But somehow, it is still alive, and trying to grow. I’m not going to disturb it just yet — I’m afraid to shock its little system right now. But I feel like I’m being given a second chance. I am watching very carefully. This time, if it grows, I will plant it. I will take better care. And maybe, just maybe, we will flourish together. Geranium Bud, March 22nd 2015.